Springtime means new beginnings and since yesterday was the first day of Spring I thought today would be the perfect day to introduce some of the new jewelry designs that will be available starting in April 2013 (four of them are picture above). * The Stronger Every Day necklace is a 1 x 1 square charm paired with a dumbbell in red, green, or blue. * The Beast Mode key chain is a great gift for both the women and men in your lives. * The Transform necklace is a domed and hammered charm paired with three tiny dyed jade beads. * The Live Past Parallel necklace has each word on a a separate charm and it’s paired with the NEW barbell design or, with the dumbbell color of your choice. I’m excited to grow this line of jewelry and very much appreciate your continued feedback and support. So, of course, we’re at #3 of the March Madness giveaways where three winners will be able to choose a piece of jewelry from the new or existing designs! To enter the giveaway, please leave a comment telling me your favorite new jewelry design and, if there are some new types of beads you’d like to see included in the necklace designs, I’d love to hear more. This giveaway is open to people worldwide. Please leave a valid email so that I may contact you if you win and, once notified, the winners must contact me within 24 hours with their selection or a new winner will be selected. My favorite is probably the “Stronger Everyday.” Although, I think they are all pretty cool! I love the Transform necklace. It sets the tone for my fitness goals – not just to lose weight but to change and move forward to a healthier and more fit lifestyle. I also love the color combination of the beads. Love the purple! Love the Transform cause I believe that’s what I’m doing everyday! Your jewelry is awesome. Having just had a hip replacement and anxious to get back in shape, I love the “Endure” necklace idea. It would be a great motivational piece during my rehab and afterwards as a sign of how badly I want to rock my recovery. And I intend to do just that! I’m looking forward to seeing the new bracletes with the “Just Run” mantra. I know personally, I will never be the first to cross the finish line but as long as I get out there and move, I’m ahead of the game! My favorite is the “stronger everyday! You’ve got to take life one day at a time, step by step, but always moving forward, always progressing! Love the “Beast Mode” key chain. Somedays you just have to get out there and get after it! The Live Past Parallel necklace is AWESOME! I love that barbell charm! Great site! I love “Stronger Everyday,” “Transform,” and “Live Past Parallel” – that one, especially, is really cool!! So many amazing options here, I love it! Love Stronger Every day….to me means you don’t stagnate or stay in the same place but you get going from strength to strength. As you already know I do have as pecial fondness for the “Beast mode” message and the keychain color is so pretty… But, I have to admit that the “Strong every day” necklace would go very well with the path that I have chosen to follow. You know what? I love them all! I really like the transform necklace with the beads! I love the stronger everyday charm, but I also can’t wait to see the “Just Run” charm :). little sneakers would be really cute with that! I love all 4 of the new designs but if I had to pick just 1 it would be the “Transform” necklace. They’re all beautiful and inspirational though! i really like the ‘stronger everyday’ one. the weight charm is adorable. i also really like the mantra ‘grace’ it is such a soft word but has so many dimensions, i’m excited for that one too. I love the stronger everday! I like the stronger everyday, something to work towards. Love them all but my favorite is “stronger every day.” Whether it’s getting in my workout every day or making smart food choices, I AM getting stronger every day! Love the key chain and the strong everyday!! Transform and Stronger everyday!!! Exactly what I strive for everyday!! The stronger everyday is awesome!!! It’s so true as well! I’d say my favorite is “Stronger Everyday” because that is what I’m trying to be both physically AND mentally!! The stronger every day necklace would look sweet with a black barbell on it : ) love all your jewellery so motivating!!!! 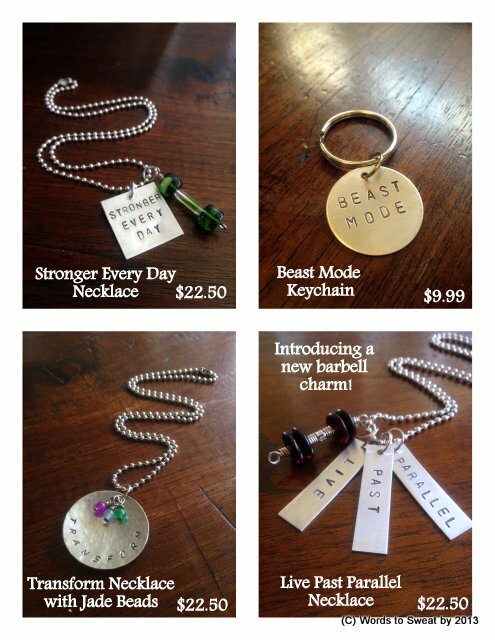 I love the “Stronger Every Day Necklace” but I’d love to rock that “Beast Mode”. All your designs are amazing and inspiring!! Patti – What kind of semi-precious bead would you like to see with the “Endure” necklace? I’d love to hear your thoughts as I haven’t decided on a final pairing yet of the bead with that charm. Jess – I will be offering a choice of dumbbell or barbell with certain designs so people will definitely be able to have the barbell with the “Stronger Every Day” necklace is they want. love your jewelry!! My favorite is the Transform necklace. I really like the Stronger Everyday necklace! I like the new necklace with “Endure”…. I absolutely love the “Run Far” bracelet. I’m a distance runner, so that’s definitely my favorite! I really like the Just Run bracelet. I’m training for a half marathon and definitely could use some motivation! I like the Live Past Parallel and Just Run! Love all the designs- very cool. I love any piece with “transform.” That has been my mantra lately….to transform my mind, body, and soul!